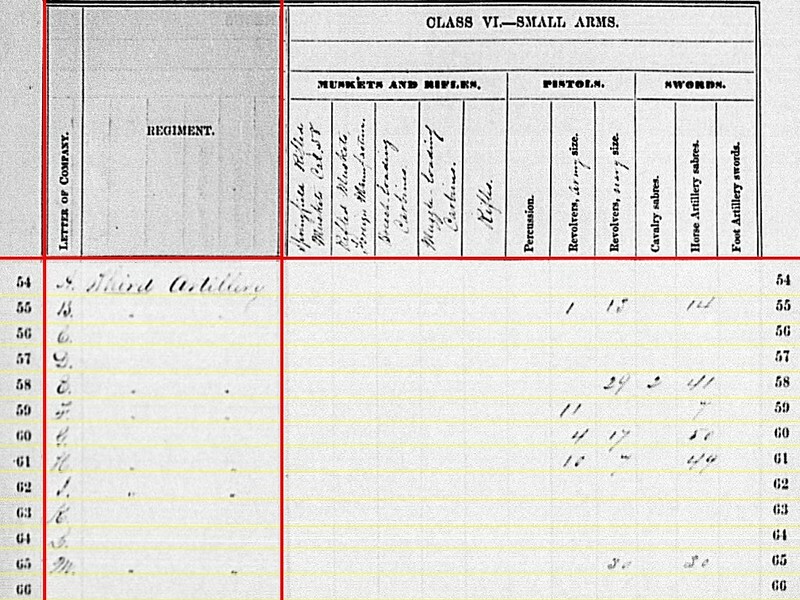 When we examined the 1st New York Light Artillery last week ago, it’s service at the mid-point of the Civil War was mainly within Virginia. Or shall we say the Eastern Theater proper? 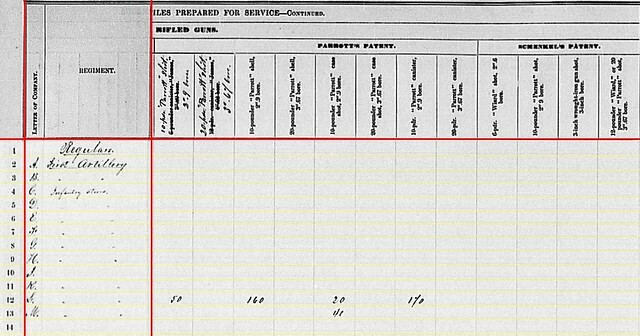 In contrast, the 3rd New York Artillery (which was a mix of heavy and light) spent the first half of the war serving in the Carolinas. 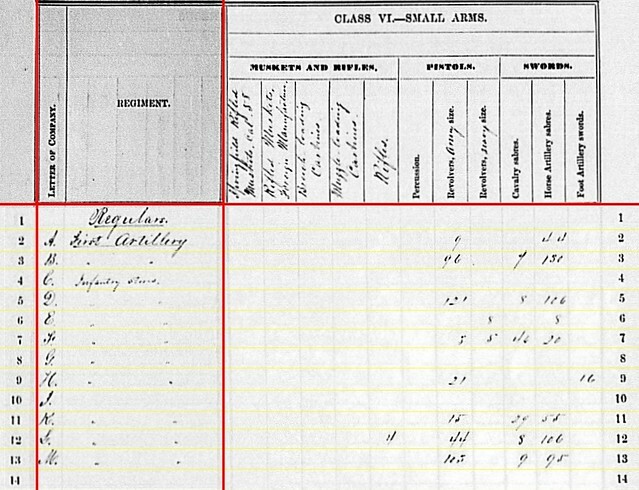 For the fourth quarter of 1862, we briefly looked at the origins of the 3rd regiment. And for the first quarter of 1863, we noted the split of the regiment, with some batteries going to reinforce efforts against Charleston. In addition to that move, over 500 two year enlistments came up in May. This brought the overall regimental strength down to 889 men. 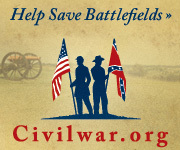 Men were transferred within the regiment to meet obligations to maintain field batteries at full manning. 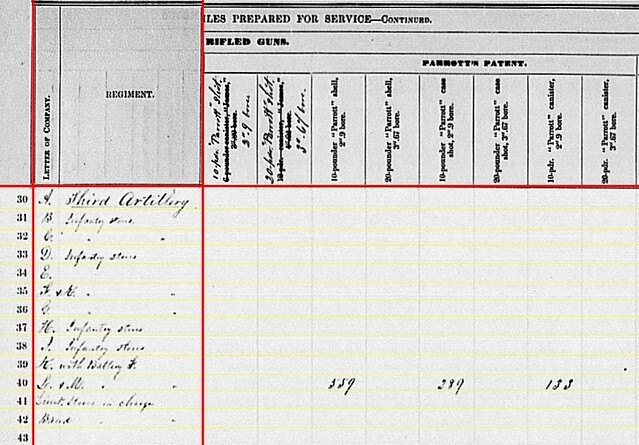 Between May and June, the remaining men of Batteries A, C, D, and G were transferred to batteries B, E, F, H, I, and M. Colonel Charles H. Stewart remained in command of the regiment, though as time progressed it was more so an administrative assignment. And with Stewart’s administrative responsibilities, he received permission to recruit replacements (with the objective of a full 1,700 men). Battery A: No return. Captain Charles White was in command of the battery when mustered out in Syracuse, on June 2. The three-year men transferred to Batteries E, I, and K.
Battery B: Reported at Folly Island, South Carolina, with six 12-pdr Napoleons. Captain James E. Ashcroft commanded. Returns from the end of June had the battery assigned to Seabrook Island, but of course part of the force concentrating for the Morris Island Campaign. Battery C: No return. Ashcroft transferred to Battery B (above) on May 22, leaving Lieutenant Charles B. Randolph in charge of the two-year men. They were mustered out on June 2. The three year men from this battery moved to Batteries I and K.
Battery D: No return. Captain Owen Gavigan was among the two year men mustered out in June. 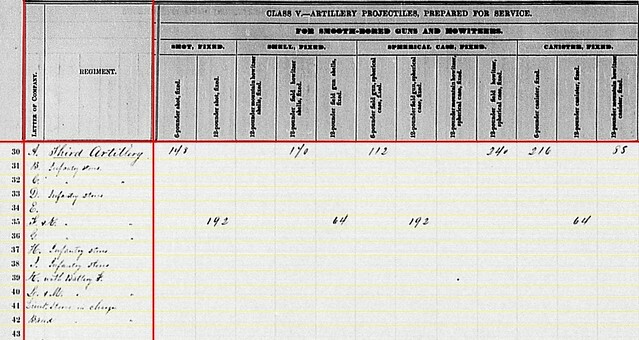 Those with enlistments remaining went to Batteries E, I, and K.
Battery E: At New Berne, North Carolina with four 20-pdr Parrott rifles. Captain Theodore H. Schenck remained in command. This battery was originally earmarked for South Carolina, but returned to North Carolina by April, part of Eighteenth Corps. Battery F: On Morris Island with six 12-pdr (3.67-inch) Wiard rifles. The location was valid for September, 1863, when the return was received in Washington. Lieutenant Paul Birchmeyer commanded this battery, then on Folly Island. Captain David A. Taylor was on detached service, with the Signal Corps. Battery G: No return. Another battery mustered out in early June. Captain John Wall rolled up that guidon. Remaining men transferred to Battery K.
Battery H: At New Berne, North Carolina with six 12-pdr Napoleons. Captain William J. Riggs in command. Assigned to Eighteenth Corps. Battery I: Also at New Berne and with six 12-pdr Napoleons. Captain John H. Ammon held command. Battery K: No return. Also assigned to New Berne at this time of the war. Captain James R. Angel was in command. For the previous quarter, and the one that followed, this battery had six 3-inch Ordnance Rifles on hand. Likely that was the case for the second quarter. This battery received many three-year men from the disbanding batteries. Battery L: As explained in earlier posts, this battery did not exist as part of 3rd New York Artillery at this stage of the war. Near war’s end The 24th Independent Battery was assigned this title, somewhat retroactively. Battery M: At New Berne with six 10-pdr Parrott Rifles. Captain John H. Howell commanded. The batteries mustered out at the start of June (A, C, D, and G) were replaced by new batteries with the same designations starting in the fall of 1863 running through the winter of 1864. So we will see them again in the summaries. in the photos from Morris Island. Battery B: 678 shot, 382 shell, 872 case, and 406 canister for 12-pdr Napoleons. Battery E: 84 shells for 12-pdr Napoleons; 20 shell, 78 case, and 6 canister for 24-pdr field howitzers; 2 shell and 6 canister for 32-pdr field howitzers. Battery G (? ): 396 shot, 87 shell, 439 case, and 160 canister for 12-pdr Napoleons. Battery H (? ): 294 shot, 150 shell, 303 case, and 136 canister for 12-pdr Napoleons. 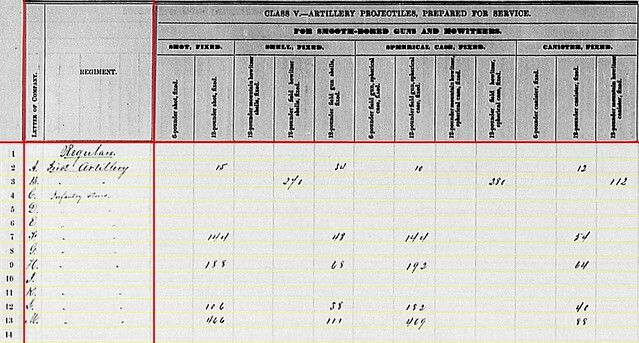 First off, Battery E had heavy field howitzers on hand in the previous quarter. And apparently the battery retained some ammunition for those big howitzers (awaiting turn in, perhaps). But that does not explain the Napoleon shells on hand. Battery G, as indicated above, mustered out in the first week of June. And no return was indicated on the first page of the summary. I offer this was a transcription error. If so, did the clerk just move everything up one line? In other words, what’s on line 60 being Battery H’s ammuntion; and line 61 that for Battery I? No evidence, just expectations! Battery F: 100 shot, 1065 percussion shell, 300 fuse shell, and 650 bullet shell for 12-pdr / 3.67-inch Wiard Rifles. And we know those projectiles were destined to be fired at Battery Wagner and, occasionally, Fort Sumter in the months to come. Battery F: 240 Hotchkiss canister for 12-pdr / 3.67-inch Wiard Rifles. Battery E: 126 Parrott shell, 30 Parrott canister, and 402 Schenkl shot for 20-pdr Parrott, 3.67-inch caliber. 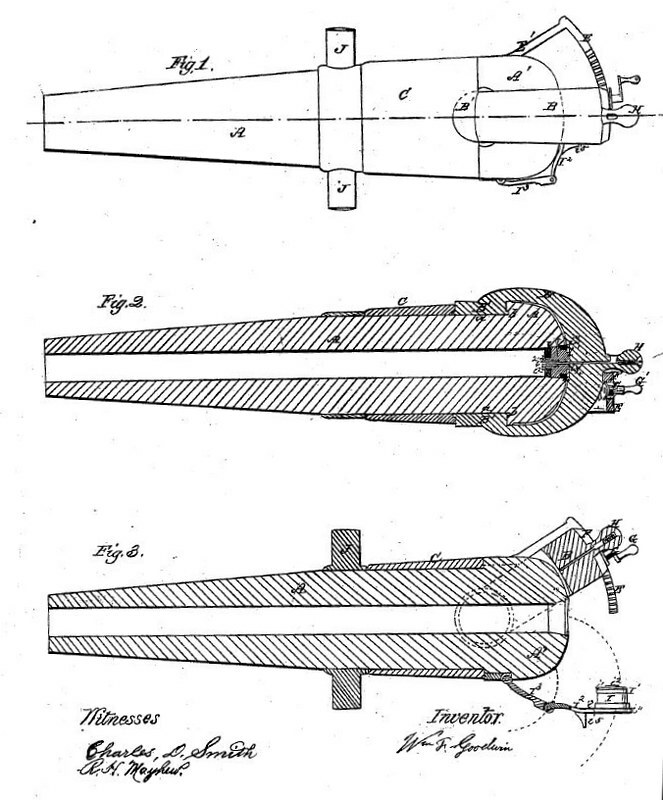 Battery M: 1203 Parrott shell, 57 Parrott case, and 134 Parrott canister for 10-pdr Parrotts. There were no tallies for any additional Schenkl projectiles or the Tatham’s canister. Battery A: One Army revolver, thirteen Navy revolvers, and fourteen horse artillery sabers. Battery E: Twenty-nine Navy revolvers, two cavalry sabers, and forty-one horse artillery sabers. 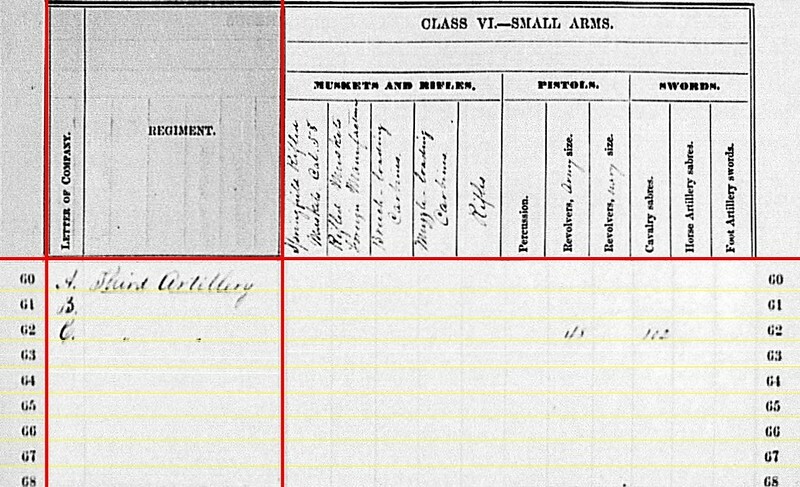 Battery F: Eleven Army revolvers and seven horse artillery sabers. Battery G (? ): Four Army revolvers, seventeen Navy revolvers, and fifty horse artillery sabers. Battery H (? ): Ten Army revolvers, seven Navy revolvers, and forty-nine horse artillery sabers. Battery M: Thirty Navy revolvers and thirty horse artillery sabers. As with the smoothbore ammunition columns, I offer that lines 60 and 61 were moved up by one. So those should be Battery H and Battery I. 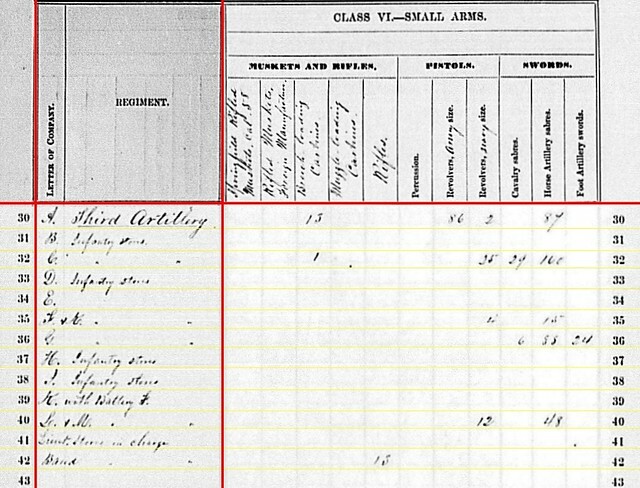 In the previous quarter, Battery H reported thirty-one Navy revolvers and fifty horse artillery sabers. Battery I reported Ten Army revolvers, nine Navy revolvers, and forty horse artillery sabers. Not a close match, but at least a little weight to consider. 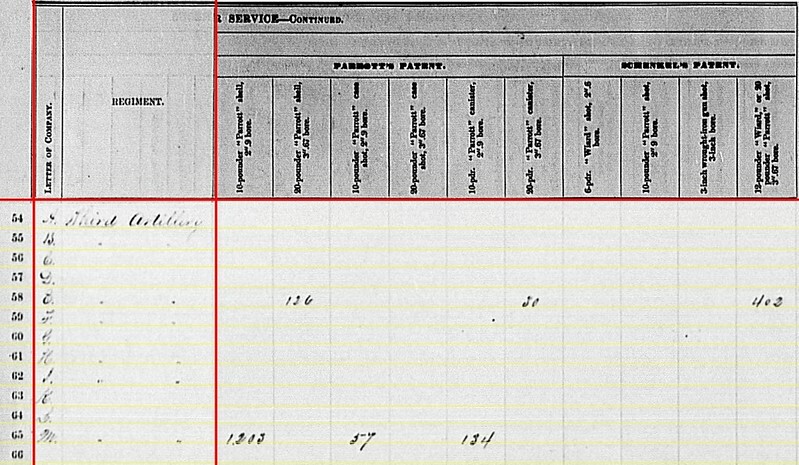 We’ll continue with the New York batteries with consideration of yet another “straggler” line – some mountain howitzers in the 3rd New York Cavalry!